Boats and PWC's can be rented from businesses in Page and at each of four marinas with tour boat cruises—from one hour up to seven hours—offered year round at Wahweap and Bull Frog marinas. Dangling Rope Marina is only accessible by boat and is 3/4 of the distance from Wahweap Marina to Rainbow Bridge National Monument. Other lake activities include swimming, fishing, scuba diving, snorkeling, water skiing, hiking and sightseeing. Photographic opportunities abound. You can even take a scenic flight by plane or helicopter over the lake, which provides a bird's eye view of how far some those 96 canyons extend from the main channel. 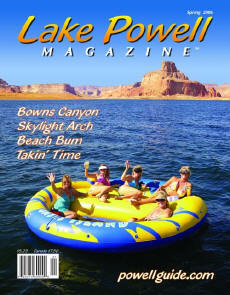 Click for Lake Powell Magazine ! Around early June, the lake's waters begin to warm and stay that way well into October with a clarity unrivaled in other fresh water lakes. While the climate is arid and humidity is generally less than 40 percent, Lake Powell is classified as a "high desert" area due to it's 3,700 ft. elevation. Water temperatures cool significantly in the winter then rise into the high 70's in the summer. When it does snow at Lake Powell, the contrast of the white against red-rock cliffs and azure blue waters makes for beautiful photographs and memories. Glen Canyon Nation Recreation Area, established by Congress in 1972, is the home of Lake Powell. The area is comprised of 1.25 million acres with the lake occupying only 13%, or 161,390 acres, of the total area, which leaves a lot to be explored by four-wheel drive or on foot. 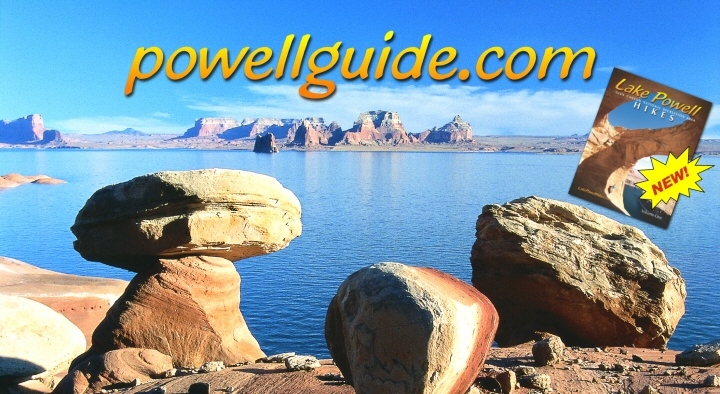 Lake Powell is named for Civil War veteran Major John Wesley Powell, who explored the Green and Colorado rivers in 1869 down through Grand Canyon. In August, 1869, Powell and his eight companions passed through the site of present day Glen Canyon Dam. Extending nearly one-third of a mile across from canyon rim to rim, the dam created the reservoir known as Lake Powell. The lake, which lies partly in Arizona and mostly in Utah, is more than 500 feet deep in places. While Utah has the lion's share of Powell's crystal clear water, Arizona lays claim to the most important part—the dam. It took 17 years, from march 13, 1963 to June 22, 1980, to fill to the planned level of 3,700 feet above sea level. Lake levels fluctuate depending on the spring runoff from the mountains and the releases needed to produce electricity from the dam's eight generators. Lake Powell's tributaries include the Escalante and San Juan rivers. Both are popular fishing areas. Types of fish found in the lake are striped bass, large and smallmouth bass, crappie, catfish and carp. You could spend the next 30 years exploring Lake Powell and still not experience all it offers. So start now!